Urinary tract infections (UTIs) account for 40% of all healthcare-associated infections according to the CDC. Urinary catheters are associated with the vast majority of those healthcare-acquired UTIs.2 The new 2009 National Healthcare Quality Report, issued by the U.S. Department of Health and Human Services' Agency for Healthcare Research and Quality, highlighted the fact that, unfortunately, postoperative catheter-associated urinary tract infections (CAUTI) increased by 3.6 percent in the past year. Medline's innovative catheterization kit revolutionized the design of an old product, the urinary catheter tray, to help the health care worker meet new demands: reducing healthcare-associated infections. How can a product re-design help? "Infections can happen due to poor technique or because the catheter is left in too long and the goal of the tray re-design is to help reduce variance in the procedure," said Lorri Downs, RN, BSN, MS, CIC, and Vice President of Infection Prevention for Medline. "By combining evidence-based technique and training with a revolutionary-designed tray, we are assisting the clinician in using a proven and safe method for catheter insertion and maintenance." Clear Photography of Tray Contents. 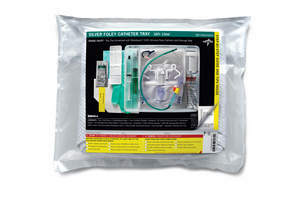 In Medline's new Foley catheter tray, the product instructions and clear color images are located on the outside to encourage the clinician to review the information before they start. To help identify the contents of the kit, the label features an actual color photo of the tray components. The photo can also be used to discuss the procedure with the patient. The outer label opens like a book and on the inside is a clear, step-by-step instructional guide to catheter insertion. "Having the photograph and directions on the outer package before opening the sterile package is a great innovation," said Vi Philbrick, Perioperative Services Educator, Parrish Medical Center, Titusville, FL. "Practitioners can open the directions like a book, look at the picture and see the diagrams and know exactly what to do before ever opening the package." Checklist that helps practitioners "do the right thing." The outer label contains "trigger tools," according to Downs, to promote the recommended guidelines from the Centers for Disease Control and Prevention (CDC). A checklist of clinical indications for catheterization is printed on a peel-off sticker. The reformatted checklist is small, making it easy to fit in the patient chart or medical record. It is also available in an electronic format for electronic documentation. "The ERASE CAUTI tray gives me a checklist, a chance to see if I am doing the right thing for this patient," said Philbrook. "It helps me to answer the question, 'Am I following the right guidelines for this patient,' before I ever think about putting in a Foley." By reducing the number of potentially unnecessary catheter placements, associated infections are prevented. Patient Education Care Cards™. Recent research from Press Ganey3 shows that the most effective patient education is provided repetitively in written information and presented in an attractive, colorful style. However, according to Sue MacInnes, Medline's Chief Marketing Officer, the typical patient education pieces found in today's Foley trays are lackluster designs that are rarely used by the caregiver. In an effort to develop a more effective communication tool, Medline created the Patient Care Card™ that looks and feels like a "Get Well" greeting card with key educational elements scripted for the clinician to review at the bedside with the patient and his or her family. "Patient and family education is an important part of every bedside procedure and this card will remind clinicians to provide this education," said MacInnes. "The caregiver can also place the card at the bedside to remind the patient and family about the appropriate care even after they are discharged from the facility. It also communicates that the facility cares about the patient." Competency Validation Tools. A key component to the effectiveness of the ERASE CAUTI program is the cutting edge online competency and measurement tools that assess and sustain staff results. The interactive competency programs are available on Medline University, Medline's online education resource. They are available to staff anytime and can be easily incorporated into the annual skills competency program for a facility's nursing staff. Revolutionary One-Layer Design. Medline introduced the new catheter system tray in August 2009 and it is now being used in hospitals across the country. The tray's novel one-layer design (versus the industry norm of two layers) supports and encourages a specific sequence of events during catheterization that helps the provider adhere to current recommended healthcare practices. The new tray design is intuitive, reduces variance in care process and promotes efficiency. "The tray is laid out in perfect order for the staff member to go from A-Z without fumbling around and creating an opportunity for cross contamination," said Melinda Hill, ER Staff Educator at Trinity Mother Frances Hospital and Clinics in Tyler, TX. "It has made placing a Foley in a busy emergency care center setting faster and more efficient." The Direct Medical Costs of Healthcare-Associated Infections in U.S. Hospitals and the Benefits of Prevention, R. Douglas Scott II, Division of Healthcare Quality Promotion, National Center for Preparedness, Detection, and Control of Infectious Diseases Coordinating Center for Infectious Diseases, Centers for Disease Control and Prevention. March 2009. Catheter-related UTIs: a disconnect in preventive strategies. Physician's Weekly. 2008; 24(6). Patient Satisfaction and the Discharge Process, Paul Alexander Clark, MPA, MA, CHE, The Press Ganey Series. 2006; p 47. Product instructions and clear color images are located on the outside of Medline's new Foley catheter tray to encourage the clinician to review the information before they start.